Epson EH-TW6700 review | What Hi-Fi? 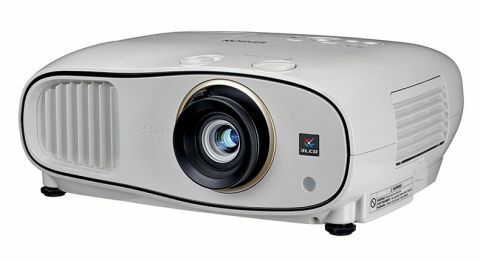 If a projector is a bridge between the big-screen spectacle of the cinema, and the comfortable familiarity of the home, then Epson’s EH-TW6700 straddles the gap perfectly. The spec sheet for the EH-TW6700 is roughly in line with what we’ve seen from other Epson products at this price. It has a 1080p chip with a 16:9 aspect ratio, a brightness of 3000 lumens, and a claimed contrast ratio of 70,000:1. It will give you a 100in image from 3m away, whether that is in 2D or 3D, with a maximum image size of 300in. Calibrating the picture, the EH-TW6700 is certainly easy to use. The remote control is simply laid out, with easily identifiable buttons for changing inputs, although we would prefer it to be backlit too. On the top of the projector you have a couple of dials to control the height and direction of the image, as well as navigational and power buttons, while on the back are the inputs: two HDMI ports, one USB, one VGA, as well as a 3.5mm output to connect some speakers. That 3.5mm output is probably going to be useful, as more often than not you’re going to want some extra audio working in combination with the projector. While it does come with an in-built stereo loudspeaker, for casual use, it doesn’t have a particularly detailed, dynamic or refined sound. While it’s adequate for those without a sound system, if you want to take a decent step into home cinema you’ll want to pair the projector with a good AV amplifier and speakers. After setting up the EH-TW6700 – opting for the ‘Cinema’ mode – we tweak the contrast, brightness, and colour saturation levels to suit our testing room. We put the Auto Iris on Normal, switch on Epson’s ‘Super White’ to temper any overexposed whites, and put Frame Interpolation on Low to adequately reduce motion judder without making movements look too processed. Turning up the Epson’s noise reduction is also recommended, to remove some of the noise in Blu-ray and DVD images. However, the downside is that it can reduce fine detail, so it’s worth checking your picture at each increment when using it. Once it has been calibrated, the results are pretty satisfying. Kicking off our test with high-action blockbuster Captain America: The Winter Soldier, the EH-TW6700 can track the superhuman leaps and punches of Steve Rogers smoothly and naturally. Later, when Rogers is talking to Alexander Pierce, there’s a palpable depth between Pierce and the walls and ornaments behind him – the EH-TW6700 conveys a crisp, sharp picture without exaggeration. Going off-world for Avatar, there’s no doubt that the alien planet Pandora’s lush plant-life and brightly-coloured animals are displayed boldly and with a clear sense of vibrancy. Epson says this projector is capable of up to just over one billion colours, and we can well believe it. You also get quite a detailed image, although there is more that could be done. The surreal exploration of Davy Jones’ locker in Pirates of the Caribbean: At World’s End renders each of Jack Sparrow’s freckles and the wisps in his unruly beard during the close-ups, but the EH-TW6700 does lack a level of subtlety at the ends of the spectrum. The translucent woodsprite in Avatar, which floats in the air like a jellyfish, comes across as lacking in texture. The projector finds it difficult to reveal the nuances in the CGI creature. Similarly, it’s tougher making out the outlines of objects, or differentiating between a black outfit and the background, during dark scenes. Upscaling could be a little more sophisticated too, when using DVDs. Watching Morgan, the felt on Morgan's hoodie as she is interrogated, or the fabric of the scientist’s jacket, isn’t quite as subtle as we’d like. But on the whole, Epson is known for putting out high-quality projectors and its latest addition is no exception to this rule. The EH-TW6700 is rich, relatively detailed, and happy to handle even motion-heavy movies. If you’re looking to get a cinema experience into your living room, this projector is a good place to start.